In a previous post , I suggested that if George Washington and Abraham Lincoln are the secular representations of two-thirds of the Holy Trinity (Father and Son, respectively), then JFK is the secular equivalent of the Holy Ghost, sent to revitalize our national consciousness and mission, only to be suddenly snatched from our midst to become an ethereal, yet informing, symbol of unfulfilled national potential. Since that November day, Kennedy’s assassination has held a prominent place in American life – not just as a tragic moment that seems to hold long-range implications, snuffing out a brief candle of energy, excitement, and rededication – but as the center of a cottage industry in speculation. One might say that the Kennedy assassination is the ultimate conspiracy-theory subject. So significant, yet so inexplicable. So public, yet so lacking in conclusive evidence. In most conspiracy theories (the “faked” moon landing, the “inside job” responsible for 9/11, etc. ), there is general agreement among theorists about both what really happened and who is to blame. In the case of November 22, 1963, there are dozens of theories floating around. Mark Lane got the ball rolling with his book Rush to Judgment, published in 1966. Lane’s book was an indictment of the Warren Commission Report. Lane accused the Report of being assembled to justify a foregone conclusion, namely, that Lee Harvey Oswald had acted alone in killing the president, and Jack Ruby had acted alone in killing Oswald. In this assessment, Lane was not totally off-base. I have read much of the Warren Commission Report, and it does seem that evidence supporting the approved theory was given more weight than evidence against it. It is indeed likely that the purpose of the commission and its report was to reassure the American people that the assassination had been resolved and that it went no further than Oswald and Ruby, acting independently. Far from accomplishing this, however, the Report provoked an unending parade of speculation, from thoughtful analysis to outright nonsense. Upon the publication of Lane’s book, an entire generation of theorists began reassessing the issues and publishing books, articles, and films (both documentary and fictionalized) purporting to solve the case – or at least demonstrate that it had not been solved. Many of these efforts name culprits – the Mafia, the Central Intelligence Agency, Vice President Lyndon Johnson, Fidel Castro, various husbands betrayed by Kennedy’s notorious woman-chasing – the list goes on and on. One book, Bonar Menninger’s Mortal Error (1992), alleges that there was no conspiracy and that Oswald indeed fired a shot that hit Kennedy, but the fatal wound to the head came by accident from the rifle of George Hickey, a Secret Service agent in the car behind the president’s. The best-known conspiracy theorist was Jim Garrison, New Orleans District Attorney who actually managed to bring a local businessman, Clay Shaw, to trial on charges of being involved in the assassination. Although the trial was poorly pursued and Shaw was acquitted in less than an hour by the jury, Garrison’s idea was taken up by filmmaker Oliver Stone, who turned it into the 1991 movie JFK, itself a mishmash of various theories Garrison and others had put forward a various times, but which is taken by many viewers to be an accurate representation of events. Garrison continued to create new theories implicating the FBI, the Dallas Police Department, and wealthy Texas oilmen. Perhaps his most bizarre idea was that a man hiding in a sewer opened a manhole in the street to fire at the president. His attack on the “single bullet” theory has been thoroughly debunked, as has his misapprehension of the frame-by-frame analysis of the Zapruder film. 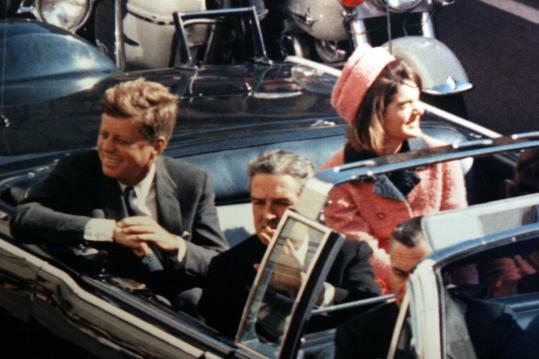 To me, however, the problem with the conspiracy theories I’ve encountered is this: although the official story is hard to believe, it is still more plausible than the theories (nonsensical ones such as that JFK was not actually killed, or was not actually in the car at all, and less bizarre ones such as multiple shooters or deliberately mishandled security). The conspiracy theorists are looking through the wrong end of the telescope. They start with a foregone conclusion and work backwards, seeking evidence to support it. The Warren Commission, of course, had a mission, but they collected evidence and considered as much as they could without filling in holes with speculations that furthered their ends. Almost all conspiracy theorists are quick to make unsubstantiated assumptions about actions and motives if it helps to facilitate tenuous connections to support the theory. The way I look at a case like this is through the small end of the telescope. What would be the origin of the conspiracy, and how would its perpetrators expect to accomplish it? If you wanted to assassinate the President of the United States, how would you go about it? Would you propose to do the killing in a public place with thousands of people watching? Would you plan a massive effort requiring the knowledge, cooperation, and coordination of Federal, State, and local authorities, doctors and nurses, military personnel, judges, Members of Congress, the entire Warren Commission (members and staff), and assorted by-standers and hangers-on? Why not do it privately, with just a handful of people? The bigger the conspiracy, the more difficult it is to control both action and information. And if you were going to enlist the help of outsiders, why place such important responsibilities on the unstable Oswald and the blabber-mouthed Ruby? Wouldn’t you want someone more reliable? A large-scale conspiracy would require a large-scale coverup. Here’s a simple example: the film JFK portrays a popular theme among conspiratorialists – a bullet uninvolved in the actual assassination being planted near one of the victims after they had reached the hospital. Think about that. You conspired to have multiple shooters, but you are trying to persuade people that only one person fired shots. And the way you choose to do this is to introduce yet another bullet into the picture? Presumably, the conspirators would be trying to reduce, not increase, the number of bullets connected to the scene. It’s even harder to imagine that the hundreds of people necessary for such a massive conspiracy could be mobilized and marshaled into their roles without its being discovered beforehand, or a small detail going wrong, or somebody spilling the beans afterward. So what’s the deal? Why do such unlikely scenarios as the one advanced by Garrison and Stone have such a following? Because anything else is, to many people, just too scary to contemplate. It is easier to accept that a large, organized group of skillful, well-funded people plotted a successful assassination than to believe that the universe is so irrational, so uncaring, and so unjust that Lee Oswald – this pipsqueak of a man whose whole life had been one chaotic screw-up after another – someone so inconsequential – could take out someone so consequential as John F. Kennedy. For many people, that kind of insecurity is just too hard to accept. Bruce…..It was the guy in the sewer….the so called ‘smoking man’ who was doing the aliens’ bidding….it’s true cuz I saw it on the TV show X-Files…..anyway, another good read from agood man to know….